"Many believe Djokovic’s feud with out-going ATP Tour chief Chris Kermode proved to be a distraction for the world No 1 and ultimately caused his downfall in California." From Indian Wells to Miami, the ATP Tour heads east for its second straight Masters Series event in the United States. Part two of the prestigious Sunshine Double takes place in Florida but, after 32 years at Crandon Park in Key Biscayne, the tournament moves to a new venue. Hard Rock Stadium, home of the Miami Dolphins, will now stage a leading tennis tournament, with the men's singles competition starting on Wednesday. 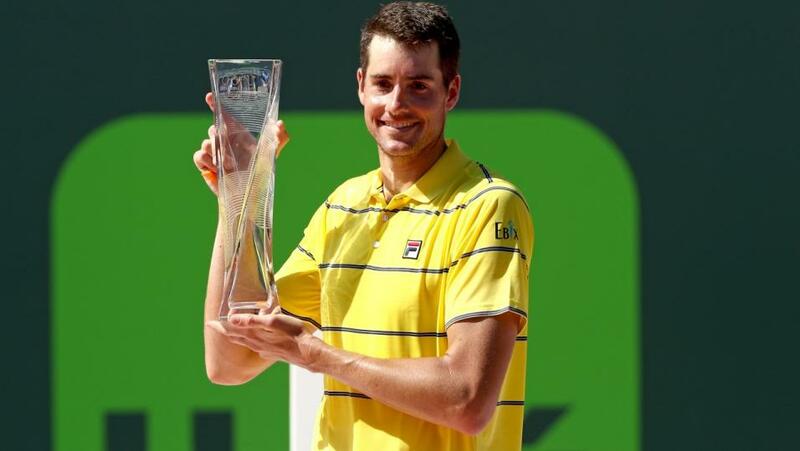 Twelve months ago, John Isner was crowned the most unlikely of champions. Seeded No 14, the big-serving American collected the most important title of his career and arguably created the biggest shock at this event for over 30 years. In 2019, top seed Novak Djokovic will be chasing a seventh Miami title but his hopes of securing a fifth Sunshine Double were crushed last week when he was sensationally beaten by world No 39 Philipp Kohlschreiber. The 35-year-old German had lost eight of his nine previous meeting with Djokovic but needed just two sets to send the Serbian packing in round three (last 32). Many believe Djokovic's feud with out-going ATP Tour chief Chris Kermode proved to be a distraction for the world No 1 and ultimately caused his downfall in California. Assuming he is truly focussed in Miami, who is likely to be Djokovic's main rivals these next two weeks? Roger Federer: Is a three-time winner in Miami and arrives from Indian Wells where he reached the final, only to lose 3-6 6-3 7-5 to Dominic Thiem. The 37-year-old converted just two of 11 break points during the match, and made 32 unforced errors compared to Thiem's 25. Had been hoping to travel to Miami in search of a first Sunshine Double since 2006. Karen Khachanov: His battling defeat by Nadal at the quarter-final stage in Indian Wells - where he lost following a brace of tie-break sets - shows that the 22-year-old from Moscow is probably destined for greatness. Milos Raonic: Went into Indian Wells a little under the radar but as some big names fell by the wayside - on his half of the draw - the Canadian quietly made it through to the semi-finals before losing in three sets to the eventual champion. The 28-year-old is yet to win a tournament at this level, having lost three Masters Series finals, as well as Wimbledon in 2016. Dominic Thiem: Despite being world No 8 going into the first Masters Series event of 2019, he wasn't expected to triumph in California. It was his maiden title at this level and the win takes him to No 4 in the World Ranking. He said afterwards: "It feels just unreal what happened these last 10 days." The omens look good for the Austrian as he moves closer to his beloved clay. The European clay court season begins in early April and in 2018 he reached the final of the French Open. Check out the latest prices for the Miami Open.